According to ENR, “Last month, the Metropolitan Transportation Commission's peer review panel, overseeing the TJPA's investigation into the causes of the fracture, approved the repair scheme, designed by the project's engineer-of-record, Thornton Tomasetti. 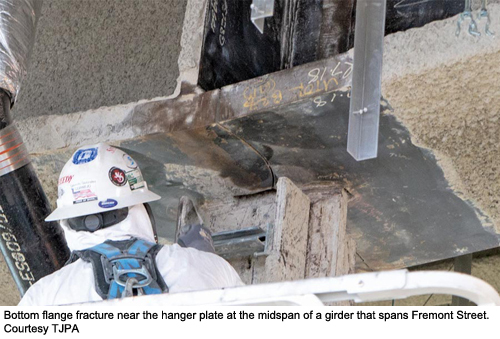 Materials for the repair, which also includes the same fix for identical First Street girders that did not fracture, may be available in two weeks, said Mark Zabaneh, TJPA's executive director, at the Jan. 10 TJPA board of directors' meeting." The JBPA will receive its next update in its February meeting that is scheduled to be held on Valentine’s Day, February 14. Hopefully the TJPA will be able to give the transit riders in San Francisco good news and a schedule for the re-opening of the transit center.